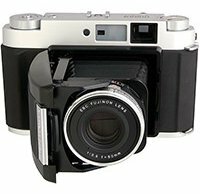 If you missed your chance to grab a new, sealed Fujifilm GF670 6x7 folding medium format film camera during its production run, you will have another chance soon. B&H has reportedly found an unspecified number of brand-new GF760 cameras in one of their warehouses. The rangefinder camera accepts 120 and 220 roll film and uses a Fujinon EBC 80mm f/3.5 lens, complete with bellows. The camera has a built-in light meter, allowing the use of an aperture priority exposure mode in addition to fully manual shooting. Its electronic shutter offers shutter speeds from four seconds to 1/500s. The built-in lens is equivalent to 40mm in the 6 x 7-centimeter format and 44mm when shooting 6 x 6 cm format and folds fully into the camera when not in use. To avoid damaging the lens, it must be set to infinity before folding it closed. If you’d like to get your hands on an unopened GF670, preorder it now from B&H. It will cost you right around US$1,800 and is expected to be available in early February. This isn't the medium-format Fuji GF camera the internet is buzzing about lately, but for analog photographers, it’s unlikely this exciting opportunity will present itself again.